I shared my recent Amazon haul on Instagram (it’s saved in my highlights in case you want to watch!) and it’s so good, I want to recap for you here. First, let’s talk about these high-waisted workout leggings. Before I discovered these, I was about to shell out $100+ for these name brand leggings. Thankfully, I decided to give this $25 option a try and I’m so glad I did. The fabric is incredible quality and has withstood high intensity workouts. I especially love the pockets on each side and there’s another small pocket for your keys in the waistband. I also picked up this knotted crop top after having previously paid $54 for this name brand version. While the fabric is a bit more lightweight, but at $15 it still gets the job done. You’ve already seen this navy floral tie front dress. 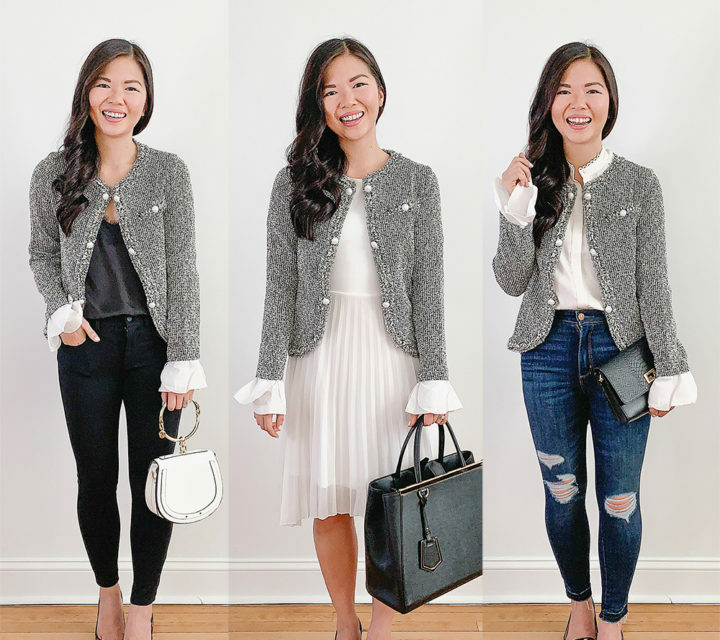 This is my go-to style for spring and summer. This one is only $23 and comes in 15 colors. The fabric on this dress isn’t very breathable (but I’ve bought other dresses from Amazon that have been). Thankfully, between the cutout detail and the fit and flare silhouette, I’m not too worried about overheating. Quick tip: pick up some printed square scarves for only $10 and tie them to your purse. It’s a great way to refresh your bag and complete your look. You can also tie it in your hair for a little double duty! I have this scarf in a flamingo print, a blue ginger jar print and a red/blue geometric print. 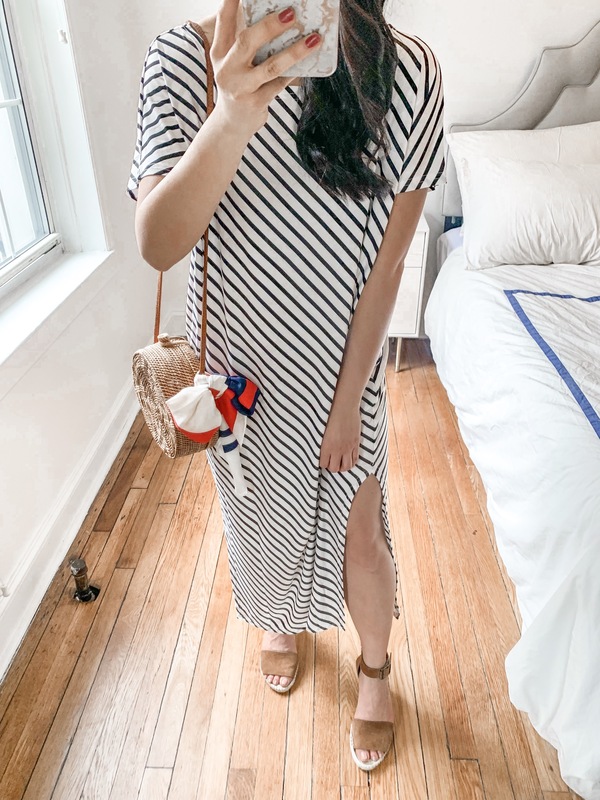 This striped t-shirt dress is a great coverup for the beach or pool. It’s pretty soft, only $21 and comes in different colors and a long-sleeve option. I love that it has slits on both sides! I don’t have a lot of red in my wardrobe, but this off the shoulder dress is making me reconsider. I wore this dress in Charleston and I just love the oversized floral print and the ruffle detail. FYI – this dress wrinkles a bit, but it comes out super easily with a steamer. It’s hard to believe this romper is only $15. It makes you wonder how much retailers are marking up their clothes! Granted, when it comes to fast fashion, you tend to get what you pay for. Even so, this romper is great for the beach or pool. I love the geometric print and the blue/pink color combo, and it also comes in stripes. Lastly, this flowy, floral maxi dress is a personal fave and a popular buy by those who watched my Instagram stories. I wore it in Paris last month and was surprised at how perfect the hem length is for a short girl like me. I wore a pair of 3” inch block heels with the dress and it perfectly grazed the floor. This dress comes in 21 colors and prints, but I’m partial to this neutral floral print with pops of green. It’s a great romantic option for spring! It seems like you guys are thoroughly enjoying my try on posts, so I’ll be trying to share more of these on both Instagram and on the blog. If there’s anything you’d love to see, just let me know! I really love that blue dress!